These rare flightless birds of a feather need to flock together to keep their species afloat. 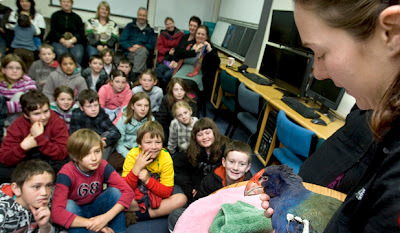 There are only 220 Takahe left in New Zealand and about 30 have been treated at the New Zealand Wildlife Health Centre at Massey University. And three of the birds were the focus of a sponsorship drive recently run by the Centre at the Tiritea School. Sadly one of the birds had to be put down due to a severe leg injury. 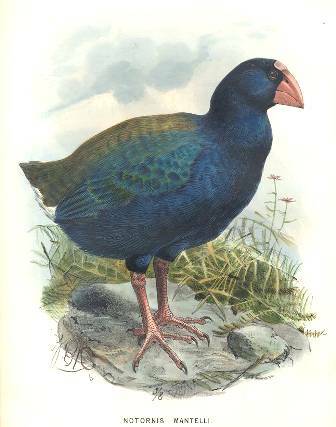 The Takahē or South Island Takahē, Porphyrio hochstetteri is a flightless bird indigenous to New Zealand and belonging to the rail family. It was thought to be extinct after the last four known specimens were taken in 1898. However, after a carefully planned search effort the bird was rediscovered by Geoffrey Orbell near Lake Te Anau in the Murchison Mountains, South Island, on November 20, 1948.